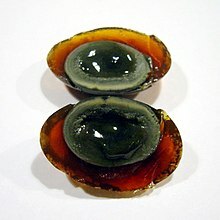 A century egg is a cured duck egg. They are made by putting the egg in a mix of clay, salt, quicklime, and ash. A century egg is not really 100 years old. People call it a century egg because it looks different and takes months to make. Century eggs can also be made from quail or chicken eggs. This page was last changed on 13 March 2019, at 16:42.